Root Canal failure: learn why Root Canal Treatments fail. Very often patients show unreasonable scepticism about Root Canal Treatment, because they had one in the past and it ended with an extraction; others expect to be guaranteed a 100% success rate to give consent to the procedure. What are the realistic chances of success? The purpose of a Root Canal procedure is to remove completely from the tooth the affected dental pulp (the nerve) and all the bacteria and toxins associated with its degenerative process. This is achieved through the sequential use of mechanical instruments and the generous irrigation of the canal space with powerful disinfectants. With the proper equipment ( rubber dam, apex locator, magnification etc. ), and the right skills and experience, it can be done most of the time. The variable of the equation is the internal anatomy of the single tooth: straight large canals can be cleaned with consistency. Calcified canals, severely carved canals, canals splitting in the last mm, lateral canals, canals obliterated by previous root filling materials (retreatment), often pose a tough challenge even for the expert clinician. Statistically success is very high (more than 90%) when the pulp is inflamed but still vital, drops when the nerve is necrotic (dead, therefore with a bigger number of bacteria), and is the lowest in case of Root Canal Re-treatment. Often the Root Canal Treatmentitself is successful , but the removal of tooth structure to achieve the goals of the procedure, or the lack of a proper restoration (dental crown), cause a fracture and an extraction at a later stage. It is essential that you discuss with your dentist the realistic chances of long term success for your single case, in comparison with alternative procedures. 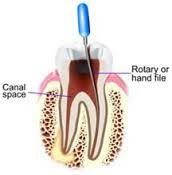 I offer a 15 mins FREE ROOT CANAL CONSULTATION, no strings attached, to get a honest opinion at no cost.